Former member Michael Ritzman serves the Lord as a missionary of The Lutheran Chruch -- Missourt Synod in Papua New Guinea. More information about his trip can can be found here on the LCMS website. Michael was born in Seattle, Wash., and later moved to Fort Wayne, Ind. Before becoming a missionary, Michael worked in accounting departments in the healthcare field, in property management and helped run a business with his wife Beth. Beth is also from Seattle, Wash. She likes reading, gardening and sewing. Michael and Beth enjoy spending time with their six beautiful children - Moreah, Onika, Azrielle, Vignette, Eric and Charles (who was recently born on the mission field). 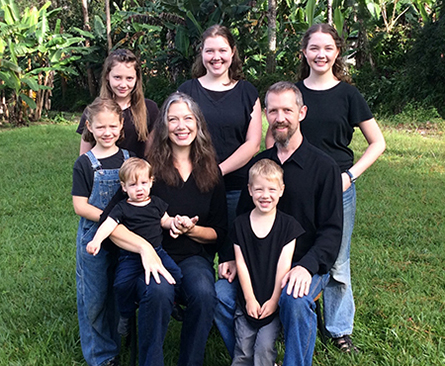 Please pray for Michael, Beth and their family as they serve the Lord in Papua New Guinea. Ask God to give them patience as they continue to learn the culture, wisdom as they become better acquainted with their various roles, and joy as they share the Good News of Jesus Christ with gladness! Please pray that the hearts of people here in the United States are moved through the power of the Holy Spirit to pray for and to financially support the Ritzmans so they may “go with this family” on their journey of faith. To all of the family’s mission supporters, Michael says, “God is doing amazing things on this side of the world. Your support allows us to help spread the Gospel despite many difficult challenges. People are blessed, souls are saved and God is glorified.” Let us give thanks to God for Michael, Beth and their family serving His people in this part of the world. Learn more about the work being done in Papua New Guinea and in the Asia region.